I’ve posted in the past about the lying voices we listen to in our heads. Tapes of negativity, self-loathing, and catastrophic thinking play on repeat for many people. But there’s one thing you can do to fight these voices…become a truth teller. Becoming a truth teller means that you fight against the lies with the truth. You stay aware of the truth and use it to cope and learn from mistakes. The truth doesn’t always feel good, but it’s an important thing to focus on in order to grow in emotional intelligence. Why is it important to become a truth teller? Focusing on the truth will help your thoughts not spiral into the “what if”. Sometimes there’s scary things that are true, but our minds will often take the negative and create a mountain out of mole hills. A balanced thought sees the truth of a situation and stays in the present with it. It doesn’t drift into the past and woulda, coulda shoulda, nor does it jump into the fears of the future of what could be. Truth telling helps contradict lies. Think about the devil and angel picture of them sitting on each of your shoulders. The lies are whispering in one ear and the truth fights back by deflecting each lie before it has a chance to take root in your thoughts. Truth keeps you from getting taken over by the quick sand of lies that will take you down quickly. There are times that the negative chatter has some truth to it. I did make a mistake. I shouldn’t have done or said something. My humanness shows and it will hurt someone. Admitting the truth of that situation is what helps us learn from it. When we get defensive and try to eliminate any ounce of shame about our mistakes, we miss a good relational opportunity to grow as a person and deepen our relationships. Genuine apologies and making amends can be a vulnerable growth spurt for relationships. You cannot get to this place if you do not admit the truth about a situation. 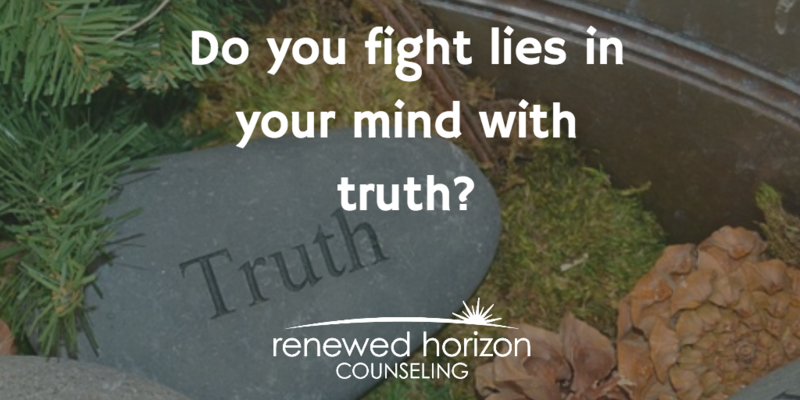 Being a truth teller has great benefits for both you and your relationships. It takes self-awareness and taking a long hard look in the mirror. Is it hard for you to keep your thoughts rooted in what is true?